The fashion trends of women’s clothing constantly change. Knowing the changes for 2019 will help to keep yourself on the top of your game. How do you become acquainted with the current trends of the year? One way is to read the most popular fashion magazines. You should also visit the online fashion websites. You most likely will find that the women’s clothing trends for 2019 are a lot different than you had expected. Let’s take a look at some of the biggest 2019 fashion trends. Distressed jeans can give you a chic, Tomboy, and original look. You may consider distressed denim which is slightly ripped at the knees to be rough-looking and masculine. However, couple them with ladylike garments and you’ll have a perfect addition to your wardrobe. A personal stylist will tell you the trick is to style the distressed jeans with the right pieces. 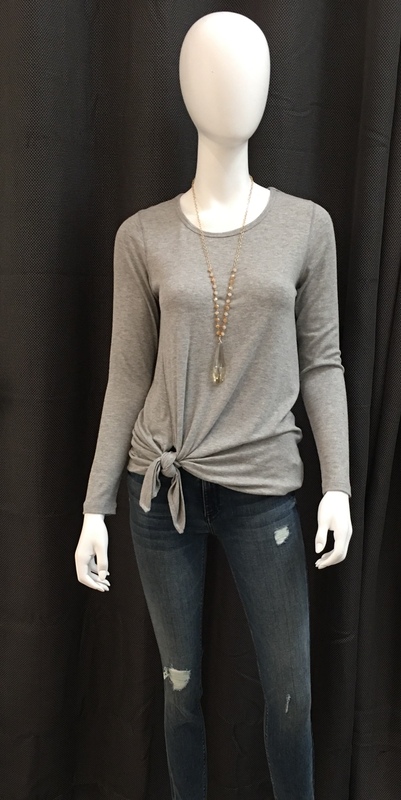 These distressed Black Orchid jeans coupled with a grey fifteen side top with a round, scooped neckline and long fitted sleeves give a gal a perfect look for winter or spring. For a feminine touch, the outfit is finished with a long pink, lush necklace. Camouflaged print has survived for 2019. In spring, you can expect to see camo pieces on the streets everywhere. A fashionable boost for any outfit can be an army print. Pants are considered a fantastic way to incorporate camouflage print into your outfit. These camouflage pants can replace your blue jeans. The key to modern, up-to-date outfits of women’s clothing is the incorporation of camo. For a unique look, couple camo Mayi jeans with a black star-studded Zadig and Voltaire tee. A stylish detail to add to the casual look of this outfit is its Melie Bianco crossbody purse. For a sporty look, the Quay sunglasses do the job. For spring 2019, bold is the word. Women will be wearing the most eye-catching and the brightest stripes in spring. Dresses like this one with bold and colorful stripes are predicted to be popular in women’s clothing this spring. You don’t need a personal stylist to know the secret of wearing stripes is that you shouldn’t overdo them. This knit dress is perfect for the office or anytime at all. Its multi-colored and large-sized stripes are so very easy-to-wear. It surely will be a wardrobe staple for spring. For spring, mini bags are in. A coordinating color to pick up on the largest stripe is a fantastic detail to this outfit. Add the oversized sunglasses and the outfit is complete. If you’re looking for the latest fashion trends of 2019, visit the Scout and Molly’s in Quarry Village in San Antonio, Texas. You’ll find that our knowledgable personal stylists are here to offer you a friendly and fulfilling experience that will end with you looking (and feeling!) your best all throughout the year.